Mathias Cunningham was born about 1818 in County Waterford, Ireland. The exact location of his birth and his parents are currently unknown. Mathias married his wife Margaret Litchfield in Ireland. Margaret was born about 1818 in County Waterford, Ireland. The exact location of her birth and her parents are also currently unknown. Research completed by others also indicates that the couple may have had another child born prior 1847. Ellen M. Cunningham and Margaret Cunningham married two O'Neill brothers who were also Irish immigrants. Ellen married Michael O'Neill on 20 April 1871. Margaret married Patrick Andrew O'Neill about 1875. Michael and Patrick are the sons of Thomas O'Neill Jr and Bridget Conboy. The O'Neill lineage was extensively researched by two descendants - George K. and Patrick G. O'Neill. The cousins published their research findings in a book "O'Neill Descendants of Con & Katherine 1700-2000". 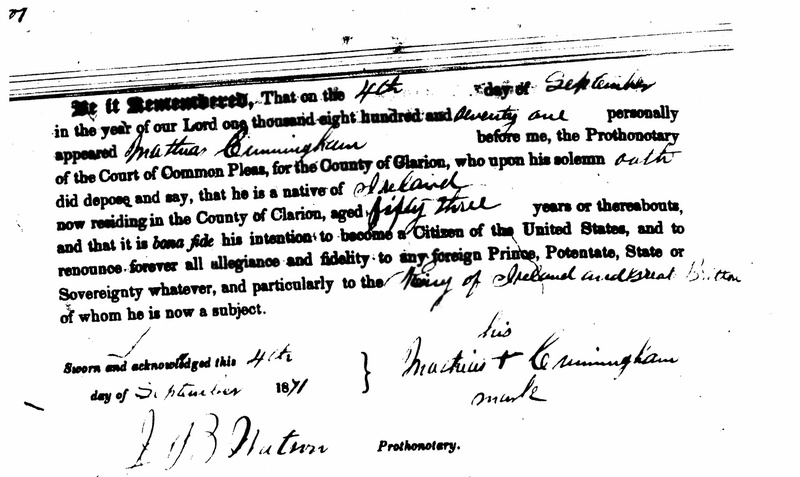 The application for citizenship indicates that Mathias Cunningham departed Ireland in 1869 and arrived in the United States of America June of 1869. The occupation for M. Cunningham is recorded as a Laborer. The occupation for Margaret Cunningham is recorded as a housekeeper. The personal estate of M. Cunningham was $10. All members of the household were born in Ireland. Mary, James, Catherine and Bridget Cunningham were attending school. The census also indicates that M. Cunningham was denied from voting. The box for denied voting was checked because Mathias was not a United States Citizen when the Census was recorded. Let it be Remembered, That on the 4th day of September in the year of our Lord on thousand eight hundred and seventy one personally appeared Mattias Cunningham before me, the Prothonotary of the Court of Common Pleas, for the County of Clarion, who upon his solemn oath did depose and say, that he is a native of Ireland now residing in the County of Clarion, aged fifty three years or thereabouts, and that it is a bona fide his intention to become a Citizen of the United States, and to renounce forever all allegiance and fidelity to any foreign Price, Protentate, State or Sovereignty whatever and particularly to the King of Ireland and Great Britain of whom he is now a subject. The mark that Mathias placed on the page which was used in place of his signature. This very likely indicated that Mathias never learned to write and could not sign his name. A decade after arrival Mathias' life changed considerably. His children grew and married. He also lost his wife Margaret. There is no record of Margaret in the 1880 United States Federal Census. The date of her death is currently unknown and would have occurred after 8 June 1870. In 1880 Mathias Cunningham was living with his daughter Ellen Cunningham and her husband Michael O'Neill and their numerous children. The family was enumerated in the 1880 United States Federal Census on 16 June 1880 in Clarion, Clarion County, Pennsylvania. Mathias is recorded as 70 years old in the census. This defers from the other references to his birth however it is not uncommon for immigrants of this time period to have a range of dates associated with their birth. At this time the death date and burial location for Mathias Cunningham is unknown. Mathias was not recorded in the 1900 United States Federal Census. Unfortunately the 1890 United States Federal Census Fragment does not include any records from Pennsylvania. The death certificate for Ellen M. O'Neill records she born in Waterford, Ireland. Her parents are recorded as Mathias Cunningham born Waterford, Ireland and Martha Litchfield born Waterford, Ireland. The informant on the death certificate was her daughter Eleanor Monica O'Neill [Mrs. E. M. Mullen]. The death certificate for James Cunningham records he was born in Ireland. His father is recorded as Matthias Cunningham also born in Ireland. The informant on the death certificate was his niece Eleanor Monica O'Neill [Mrs. E. M. Mullen]. Mathias Cunningham is my 4th Great Grandfather. He is the father of Ellen M. Cunningham my 3rd Great Grandmother. My paternal grandmother Mary Eugenia McDonald is a descendant of Ellen M. Cunningham and Mathias Cunningham. 1870 United States Federal Census. Year: 1870; Census Place: Clarion, Clarion, Pennsylvania; Roll: M593_1326; Page: 408A; Family History Library Film: 552825. Record for M. Cunningham lines 22-28. Pennsylvania, Clarion County, Court of Common Pleas. Application for Citizenship - Matthias Cunningham. 1880 United States Federal Census. Year: 1880; Census Place: Clarion, Clarion, Pennsylvania; Roll: 1117; Page: 78C; Enumeration District: 065. Record for Michael O'Neill. Pennsylvania, Death Certificates, 1906-1964. Record for Ellen M. O'Neill [Ellen M Cunningham]. Certificate number 8274. Pennsylvania, Death Certificates, 1906-1964. Record for Jas Cunningham. Certificate number 110917.